The Girl's Day members teased the new couple along the hallway. It seems that the both of them were satisfied with each other as they smiled brightly. A mission letter arrived and they were shocked to be instructed to get married on the same day! Hong Jong Hyun laughed at the absurdity again. Hyeri and Minah teased the couple, making them nervous at the thought of walking down the wedding altar hand in hand. The couple were too shocked at this point as everything seems too fast for them. We Got Married host Hong Jin Young came by to congrats the new couple. 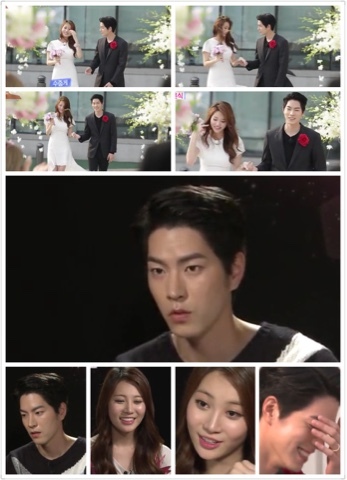 Hong Jong Hyun quickly asked for her help to host the wedding. Hong Jin Young sharply pointed out that Hong Jong Hyun looked gloomy, to which the latter denied. Haha.. Is it too much to handle? Anyway, we can count on Hong Jin Young to come to their rescue as she volunteered to help the new couple in the preparations. While the idols went back to their performance, Hong Jin Young and Hong Jong Hyun had a small talk. As a senior couple in We Got married, Hong Jin Young gave some valuable advices to Jong Hyun. A blushful Hong Jong Hyun laughed embarassly at the mention of skinship. He pointed out that Jin Young is like a military senior giving a lecture about how to get closer through skinship. At the solo interview, Hong Jong Hyun revealed that Skinship does not come easy for him and he is jealous of people who can does so easily. Finally, the couple prepared themselves for the wedding ceremony as the celebrities marched in to witnessed their union. The seats were mainly filled up with idols. In my opinion, this venue is a great place for an outdoor simple wedding ceremony. All the docorations were beautiful and we truly anticipate the arrival of the bride and groom. The couple walked in gracefully as the guests cheered for them. Yura accidentally stepped on her dress and she quickly regained her balance. The Girl's Day members teased her for the mistake. At the wedding altar, the couple listened earnestly to the wedding officiant words of wisdom. Soon after, the blushful couple took the vow to become husband and wife. Now, the newlywed were requested to looked into each other eyes and they covered their face in embarrassment. How adorable!!! They can't even looked at each other face without laughing in embarrassment! I can understand their feelings since they only met each other for two hours and the next moment they are officially married. Normally couples get to know each other for a period of time before they get married, however for this new couple, the arranged marriage happens too fast. 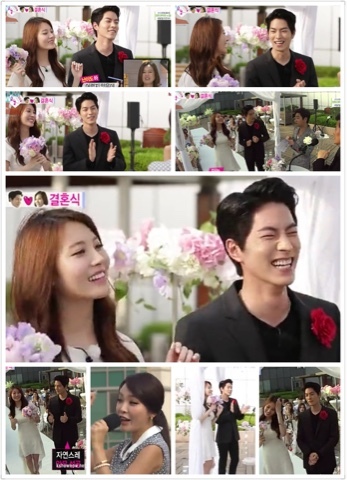 Hong Jong Hyun shared that his wife is too young for her but when he saw her in the wedding dress, he saw a bride in her. That sounds so sweet! The wedding host announced that there was a congratulation video recorded for the special day by the groom friends to send their blessings to the newlywed. Hong Jong Hyun looked bewildered and turned his head to look at the video. Here we are looking at three gorgeous men sending their blessings to the couple. Omo.. If they can come together, i would buy them dinner too. What a great idea to invite powerhouse Ailee to be the wedding singer! What a perfect wedding! I would dream of having Ailee as my wedding singer too! The couple and everyone present enjoyed her singing. With a grateful heart, the couple bowed and thanked Ailee for the romantic song. Hong Jin Young prepared another delightful song for the newlywed couple. She belted up her famous song - Love battery. Yura danced to the music naturally, but Jong Hyun looked very stiff and he observed Yura dancing to the song. He tried to follow the actions such as lifting up his thumbs and making an attempt to move to the beat. However, he looked so awkward and weird with the dance movement. Finally, the wedding was officially over as they gathered together to take a picture. Hong Jong Hyun break into a cute and shy smile. They thought that is the end of the hectic day and they heaved a sign of relieve. However, before they knew it, the couple received yet another mission. A honeymoon using a camper! Wait a minute, Yura do you think your are going overseas for the honeymoon? Of course not! Jong Hyun, now you know that your wife is so innocent? Yura suggests that they play with water for their honeymoon and Jong Hyun readily agreed. However, Yura seem to have second thoughts about watersport since she claimed that wet hair make her look ugly and she regretted what she said. Don't worry darling, you will be just fine. The next day, the newlywed couple met up with each other. Yura was impressed with Jong Hyun wearing the casual clothes stylishly. Of course, since he is a supermodel to begin with! He can fit into any outfit without looking weird. Look what Jong Hyun bring along for the honeymoon? His favorite hobby is playing RC cars to share with his wife later! Looks like he is still a boy at heart. At this moment, Yura have another concern. Is Jong Hyun able to drive a big vehicle? That is s camper and Yura can't help worrying about their safety. Jong Hyun reassured Yura that they will be just fine if he drives a little slower. In the car, Yura started the conversation by complimenting Jong Hyun for his excellent driving skills. Upon hearing that, Jong Hyun laughed and said that he is just keeping to the lane. Yura keep talking about wanting to visit New York where the Spider-Man movie was shot to look at the skycapper. Yura also joked about her native dialect and her weird way of speaking that is not standard Korean. A mission card was found in the car, and their goal is to call each other honey or darling. The couple decided to take things into their own hands and change the mission to giving each other a nickname. Before they crack their brains to come out with a nickname for each other, Yura complained of hunger. Hong Jong Hyun revealed in a separate interview that Yura is very innocent like a child. On the other hand, Yura revealed in her interview that she prefers a person from Seoul that speak standard Korean than a person who speaks with a strong dialect accents. They decided to alight from the camper to eat a bowl of udon together. Before they alight, Yura burst out a secret about her group mate Hyeri. Did she say that Hyeri failed her driving exam many times and Minah is the only one without driving license? My dear Yura there are certain things you shouldn't share publicly. However, I think they will not hold it against you. The couple are silently together, neither of them dare to make too much noise while eating. Hong Jong Hyun remembered about giving each other nicknames. In the end, they came out with Jjiong oppa and Ahyoung ( Yura birth name).